It’s a fascinating look at the way “human” digital assistants are evolving, and probably just as important, how quickly. Udo Neumann is the company’s global chief information officer. Daimler Financial Services, a division of Daimler AG, announced this week it’s partnering with New Zealand startup Soul Machines on a proof-of-concept project to see how a digital assistant with a face and a name could give personalized help to employees and customers. The companies, which have worked together for several months, are developing a “digital human” built with AI software from IBM Watson that can be programmed to answer questions related to car financing, leasing and insurance, and capabilities to recognize non-verbal cues using face recognition technology. Neural networking and machine learning tools lets an early version, named Sarah, react to spoken and typed words as well as non-verbal queues such as a loud noise or a nodding head in agreement. Sarah can be programmed with highly specialized knowledge about, for example, the latest Mercedes models and information about leasing options, said Greg Cross, chief business officer at Soul Machines. The digital human could eventually act as a “companion” for employees at a call center or training center, he said. For customers, talking to such an avatar might increase purchases among those who feel intimidated by high-pressure sales staff, said Mr. Cross. So will you one day be buying your next car from a soulful digital assistant like Sarah? Never say never…now this baby right over here, you just can’t go wrong. She hits 0-60 in five seconds….! If you’re a golf fan of any degree, and you watched the finish of the 2017 Masters in Augusta, Georgia yesterday, you know that once again it was a special Sunday finish for longtime Spanish pro golfer, Sergio Garcia. Up to yesterday, Garcia had started in 73 major championship tournaments stretching back to 1999, and had never crossed the finish line first. That all changed in a one-hole sudden death playoff after he, and English golfer and U.S. Open champion Justin Rose, walked the 18th hole for the second time in a day. With Rose’s drive off to the far right side of the 18th fairway and into the pine straw, the green nearly hidden from view, Sergio had his opportunity to strike. And boy did he, planting his approach inside ten feet of the flag, and eagerly awaiting Rose’s bogey finish before Garcia sank his birdie putt to put an exclamation point on his strong finish. That it all happened on what would have been the 60th birthday of now deceased Spanish golfer and two-time Masters winner, and Garcia’s idol, Seve Ballasteros …well, it writes itself. I had occasion to visit Augusta National and the Masters for the first time last week, and as a longtime fan and player of the game of golf, I will only say nothing can prepare you for the real thing. I’ve watched the tournament on TV and virtually for the better part of 20 years — ever since IBM first started building the Masters Website — and the undulations and diverse topography of the course are something that can only be fully grokked in person. It is, in a word, simply majestic. And par for the course, IBM continues to partner with Augusta National in order to bring the best of this world-class competition to fans around the world. This year, we brought Watson along for a tee time — you can read more about Watson’s work behind the scenes here. In the meantime, congratulations to Sergio, and Viva Espagna! Another fantastic Masters is in the bag. The power of IBM Watson has already been unleashed on the advertising industry with Equals 3’s “Lucy” media planning tool. Now, British ad tech company Unruly is using IBM Watson to create a new cognitive powered psychographic targeting tool to increase the effectiveness of digital video ads. Unruly DNA combines the company’s emotional intelligence tools with IBM Watson’s machine learning capabilities to help identify and engage the people most likely to increase a brand’s sales. The company is tapping Watson’s Personality Insights service to help advertisers to learn how and why people think, act, and feel a certain way. The Unruly DNA tool analyzes social media and other digital data from consumers and learns personality traits such as empathy, trust, assertiveness, and imagination. Unruly’s new audience targeting tool creates profiles of light buyers who, according to academic research, are more likely than heavy buyers to increase sales because they have a greater capacity to purchase more. Unruly DNA then generates a recommended list of third-party audience segments based on these characteristics, which can be used by advertisers to improve the efficiency of their targeting. “We’re really at the beginning of the journey when it comes to using cognitive technologies in advertising. Machines can be a powerful tool for marketers to recognize human desires and aspirations. We’re really excited to be at the forefront of this new world with integrating Watson capabilities into our Unruly DNA tool, helping brands increase penetration and sales by targeting their light buyers,” added Button. Unruly’s new tool is built on large scale consumer panel studies with more than 10,000 respondents combined with insights from social media accounts of participating consumers. By tapping IBM Watson, Unruly DNA uses a mix of linguistic analysis and machine learning to determine the sociodemographic and psychological profile of each panelist, clustering and aggregating the profiles based on buying patterns and purchasing frequency. All people participating in Unruly’s online consumer panel provided personal data with their express permission and consent. In Unruly’s internal and external reports and analysis, all personal data is anonymized and aggregated. When targeting adverts, Unruly uses anonymous third-party cookies which are not linked to any personally identifying information and enable users to opt out. According to recent research by Weber Shandwick, in association with KRC Research, more than half of global CMOs expect artificial intelligence to have a greater impact in marketing and communications than social media ever had. You can learn more about the IBM Watson Personality Insights service here. Back in September of 2011 I mentioned in this blog post that one of Watson’s first jobs outside of playing Jeopardy! was going to be in the healthcare industry. Well, earlier today WellPoint, Inc. and Memorial Sloan-Kettering Cancer Center today unveiled the first commercially developed Watson-based cognitive computing breakthroughs. These innovations stand alone to help transform the quality and speed of care delivered to patients through individualized, evidence based medicine. Check out this short video to learn more about how physicians and other medical professionals are able to use IBM’s Watson technology to help them with their medical diagnostic tasks. The American Cancer Society projects that 1.6 million new cancer cases will be diagnosed in the U.S. this year alone. Studies suggest that the complexities associated with healthcare have caused one in five health care patients to receive a wrong or incomplete diagnosis. These statistics, coupled with a data explosion of medical information that is doubling every five years, represents an unprecedented opportunity for the health care industry and next generation cognitive computing systems, to combine forces in new ways to improve how medicine is taught, practiced and paid for. For more than a year now, IBM has partnered separately with WellPoint and Memorial Sloan-Kettering to train Watson in the areas of oncology and utilization management. 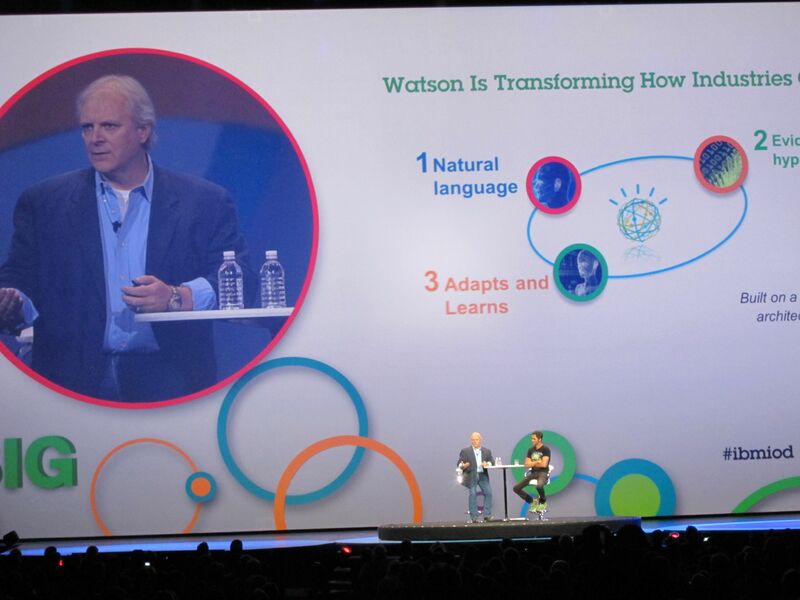 During this time, clinicians and technology experts spent thousands of hours “teaching” Watson how to process, analyze and interpret the meaning of complex clinical information using natural language processing, all with the goal of helping to improve health care quality and efficiency. “IBM’s work with WellPoint and Memorial Sloan-Kettering Cancer Center represents a landmark collaboration in how technology and evidence based medicine can transform the way in which health care is practiced,” said Manoj Saxena, IBM General Manager, Watson Solutions (see my interview with Manoj at last fall’s InterConnect event in Singapore further down in the post). To date, Watson has ingested more than 600,000 pieces of medical evidence, two million pages of text from 42 medical journals and clinical trials in the area of oncology research. In less than a year, Memorial Sloan-Kettering has immersed Watson in the complexities of cancer and the explosion of genetic research which has set the stage for changing care practices for many cancer patients with highly specialized treatments based on their personal genetic tumor type. Starting with 1,500 lung cancer cases, Memorial Sloan-Kettering clinicians and analysts are training Watson to extract and interpret physician notes, lab results and clinical research, while sharing its profound expertise and experiences in treating hundreds of thousands of patients with cancer. The Maine Center for Cancer Medicine and WESTMED Medical Group are the first two early adopters of the capability. Their oncologists will begin testing the product and providing feedback to WellPoint, IBM and Memorial Sloan-Kettering to improve usability. Throughout WellPoint’s utilization management pilot, Watson absorbed more than 25,000 test case scenarios and 1,500 real-life cases, and gained the ability to interpret the meaning and analyze queries in the context of complex medical data and human and natural language, including doctors notes, patient records, medical annotations and clinical feedback. In addition, more than 14,700 hours of hands-on training was spent by nurses who meticulously trained Watson. Watson continues to learn while on the job, much like a medical resident, while working with the WellPoint nurses who originally conducted its training. Watson started processing common, medical procedure requests by providers for members in WellPoint affiliated health plans in December, and was expanded to include five provider offices in the Midwest. Watson will serve as a powerful tool to accelerate the review process between a patient’s physician and their health plan. As a result, IBM, Memorial Sloan-Kettering and WellPoint are introducing the first commercially based products based on Watson. These innovations represent a breakthrough in how medical professionals can apply advances in analytics and natural language processing to “big data,” combined with the clinical knowledge base, including genomic data, in order to create evidence based decision support systems. These Watson-based systems are designed to assist doctors, researchers, medical centers, and insurance carriers, and ultimately enhance the quality and speed of care. The new products include the Interactive Care Insights for Oncology, powered by Watson, in collaboration with IBM, Memorial Sloan-Kettering and WellPoint. The WellPoint Interactive Care Guide and Interactive Care Reviewer, powered by Watson, designed for utilization management in collaboration with WellPoint and IBM. The cognitive systems use insights gleaned from the deep experience of Memorial Sloan-Kettering clinicians to provide individualized treatment options based on patient’s medical information and the synthesis of a vast array of updated and vetted treatment guidelines, and published research. A first of-its-kind Watson-based advisor, available through the cloud, that is expected to assist medical professionals and researchers by helping to identify individualized treatment options for patients with cancer, starting with lung cancer. Provides users with a detailed record of the data and information used to reach the treatment options. Oncologists located anywhere can remotely access detailed treatment options based on updated research that will help them decide how best to care for an individual patient. Delivers the first Watson-based cognitive computing system anticipated to streamline the review processes between a patient’s physician and their health plan, potentially speeding approvals from utilization management professionals, reducing waste and helping ensure evidence-based care is provided. Expected to accelerate accepted testing and treatment by shortening pre-authorization approval time, which means that patients are moving forward with the first crucial step toward treatment more quickly. Analyzes treatment requests and matches them to WellPoint’s medical policies and clinical guidelines to present consistent, evidence-based responses for clinical staff to review, in the anticipation of providing faster, better informed decisions about a patient’s care. WellPoint has deployed Interactive Care Reviewer to a select number of providers in the Midwest, and believes more than 1,600 providers will be using the product by the end of the year. The IBM Watson system gained fame by beating human contestants on the television quiz show Jeopardy! almost two years ago. Since that time, Watson has evolved from a first-of-a-kind status, to a commercial cognitive computing system gaining a 240 percent improvement in system performance, and a reduction in the system’s physical requirements by 75 percent and can now be run on a single Power 750 server. The transformational technology, named after IBM founder Thomas J. Watson, was developed in IBM’s Research Labs. Using advances in natural language processing and analytics, the Watson technology can process information similar to the way people think, representing a significant shift in the ability for organizations to quickly analyze, understand and respond to vast amounts of Big Data. The ability to use Watson to answer complex questions posed in natural language with speed, accuracy and confidence has enormous potential to improve decision making across a variety of industries from health care, to retail, telecommunications and financial services. For more information on IBM Watson, please visit www.ibmwatson.com. You can also follow Watson on Facebook here, and via Twitter at hashtag #IBMWatson. And below, you can see the aforementioned video where I interviewed IBM Watson general manager Manoj Saxena about Watson’s future at last year’s IBM InterConnect event. Well, the introduction of the BlackBerry 10 OS has come and gone, Research In Motion renamed itself as “BlackBerry,” the new company announced two new products, and the market mostly yawned. With that kind of ink, don’t vote the tribe from Ottawa off of the island just yet! Turns out, Watson’s also been looking to apply to college, most notably, Rensselaer Polytechnic Institute. Yesterday, IBM announced it would be providing a modified version of an IBM Watson system to RPI, making it the first university to receive such a system. The arrival of Watson will enable RPI students and faculty an opportunity to find new users for Watson and deepen the systems’ cognitive computing capabilities. The firsthand experience of working on the system will also better position RPI students as future leaders in the Big Data, analytics, and cognitive computing realms. Watson has a unique ability to understand the subtle nuances of human language, sift through vast amounts of data, and provide evidence-based answers to its human users’ questions. Currently, Watson’s fact-finding prowess is being applied to crucial fields, such as healthcare, where IBM is collaborating with medical providers, hospitals and physicians to help doctors analyze a patient’s history, symptoms and the latest news and medical literature to help physicians make faster, more accurate diagnoses. IBM is also working with financial institutions to help improve and simplify the banking experience. Rensselaer faculty and students will seek to further sharpen Watson’s reasoning and cognitive abilities, while broadening the volume, types, and sources of data Watson can draw upon to answer questions. Additionally, Rensselaer researchers will look for ways to harness the power of Watson for driving new innovations in finance, information technology, business analytics, and other areas. With 15 terabytes of hard disk storage, the Watson system at Rensselaer will store roughly the same amount of information as its Jeopardy! predecessor and will allow 20 users to access the system at once — creating an innovation hub for the institutes’ New York campus. Along with faculty researchers and graduate students, undergraduate students at Rensselaer will have opportunities to work directly with the Watson system.This experience will help prepare Rensselaer students for future high-impact, high-value careers in analytics, cognitive computing, and related fields. Underscoring the value of the partnership between IBM and Rensselaer, Gartner, Inc. estimates that 1.9 million Big Data jobs will be created in the U.S. by 2015. This workforce — which is in high demand today — will require professionals who understand how to develop and harness data-crunching technologies such as Watson, and put them to use for solving the most pressing of business and societal needs. As part of a Shared University Research (SUR) Award granted by IBM Research, IBM will provide Rensselaer with Watson hardware, software and training.The ability to use Watson to answer complex questions posed in natural language with speed, accuracy and confidence has enormous potential to help improve decision making across a variety of industries from health care, to retail, telecommunications and financial services. Originally developed at the company’s Yorktown Heights, N.Y. research facility, IBM’s Watson has deep connections to the Rensselaer community. Several key members of IBM’s Watson project team are graduates of Rensselaer, the oldest technological university in the United States. Leading up to Watson’s victory on Jeopardy!, Rensselaer was one of eight universities that worked with IBM in 2011 on the development of open architecture that enabled researchers to collaborate on the underlying QA capabilities that help to power Watson. Watson is the latest collaboration between IBM and Rensselaer, which have worked together for decades to advance the frontiers of high-performance computing, nanoelectronics, advanced materials, artificial intelligence, and other areas. IBM is a key partner of the Rensselaer supercomputing center, the Computational Center for Nanotechnology Innovations, where the Watson hardware will be located. Im my capacity as a cheerleader for my virtual big brother, IBM’s Watson technology, I’ve received a lot of questions along the way about how does IBM plan to use the technology in industry, and how can we most effectively put Watson to work. Great questions, and the answer is, it depends. Yesterday, for example, we announced a new program in partnership with the Cleveland Clinic in Cleveland, Ohio, that will create a collaboration to advance Watson’s use in the medical training field. The IBM researchers that built Watson are going to work with Cleveland Clinic clinicians, faculty, and medical students to enhance the capabilities of Watson’s Deep Question Answering technology for the area of medicine. Watson’s ability to analyze the meaning and context of human language and quickly process information to piece together evidence for answers can help healthcare decision makers, such as clinicians, nurses and medical students, unlock important knowledge and facts buried within huge volumes of information. Rather than attempting to memorize everything in text books and medical journals (now acknowledged as an impossible task), students are learning through doing — taking patient case studies, analyzing them, coming up with hypotheses, and then finding and connecting evidence in reference materials and the latest journals to identify diagnoses and treatment options in the context of medical training. This process of considering multiple medical factors and discovering and evidencing solution paths in large volumes of data reflects the core capabilities of the Watson technology. Medical students will interact with Watson on challenging cases as part of a problem-based learning curriculum and in hypothetical clinical simulations. A collaborative learning and training tool utilizing the Watson technology will be available to medical students to assist in their education to learn the process of navigating the latest content, suggesting and considering a variety of hypotheses and finding key evidence to support potential answers, diagnoses and possible treatment options. Students will help improve Watson’s language and domain analysis capabilities by judging the evidence it provides and analyzing its answers within the domain of medicine. Through engagement with this education tool and Watson, medical students and Watson will benefit from each other’s strengths and expertise to both learn and improve their collaborative performance. The collaboration will also focus on leveraging Watson to process an electronic medical record (EMR) based on a deep semantic understanding of the content within an EMR. “The practice of medicine is changing and so should the way medical students learn. In the real world, medical case scenarios should rely on people’s ability to quickly find and apply the most relevant knowledge. Finding and evaluating multistep paths through the medical literature is required to identify evidence in support of potential diagnoses and treatment options,” said Dr. David Ferrucci, IBM Fellow and Principal Investigator of the Watson project. Over time, the expectation is that Watson will get “smarter” about medical language and how to assemble good chains of evidence from available content. Students will learn how to focus on critical thinking skills and how to best leverage informational tools like Watson in helping them learn how to diagnose and treat patients. IBM and Cleveland Clinic will discuss the role of Watson for the future of healthcare and healthcare education this week at the Cleveland Clinic Medical Innovation Summit being held October 29-31, 2012 in Cleveland, OH. I sat down recently at the IBM InterConnect event in Singapore to conduct a fascinating mid-year employee performance review for IBM’s Watson technology with Watson GM Manoj Saxena. You can see the fruits of our discussion in the video below. As I mentioned in my last post, yesterday was day 3 of Information On Demand 2012 here in Las Vegas. There was LOTS going on out here in the West. We started the day by interviewing keynote speaker Nate Silver (see previous post) just prior to his going on stage for the morning general session. Really fascinating interview, and going in to it I learned that his book had reached #8 on The New York Times best seller list. In the IOD 2012 day 3 general session, IBM Fellow Rob High explains how IBM’s Watson technology may soon help drive down call center costs by 50%, using the intelligence engine of Watson to help customer service reps faster respond to customer queries. So congrats, Nate, and thanks again for a scintillating interview. During the morning session, we also heard from IBM’s own Craig Rinehart about the opportunity for achieving better efficiencies in health care using enterprise content management solutions from IBM. I nearly choked when Craig explained that thirty cents out of every dollar on healthcare in the U.S. is wasted, and despite spending more than any other country, is ranked 37th in terms of care. Craig explained the IBM Patient Care and Insights tool was intended to bring advanced analytics out of the lab and into the hospital to help start driving down some of those costs, and more importantly, to help save lives. We also heard from IBM Fellow and CTO of IBM Watson Solutions’ organization, Rob High, about some of the recent advancements made on the Watson front. High explained the distinction between programmatic and cognitive computing, the latter being the direction computing is now taking, and an approach that provides for much more “discoverability” even as it’s more probabilistic in nature. High walked through a fascinating call center demonstration, whereby Watson helped a call center agent more quickly respond to a customer query by filtering through thousands of possible answers in a few second, then honed in on the ones most likely that would answer the customer’s question. Next, we heard from Jeff Jonas, IBM’s entity analytics “Ironman” (Jeff also just competed his 27th Ironman triathlon last weekend), who explained his latest technology, context accumulation. Or, in other words, developing a better understanding of something by taking more into account the things around it. Of course, there was also the Nate Silver keynote, the capstone of yesterday’s morning session, to which I’ll refer you back to the interview Scott and I conducted to get a summary taste of all the ideas Nate discussed. Your best bet is to buy his book, if you really want to understand where he thinks we need to take the promise of prediction.